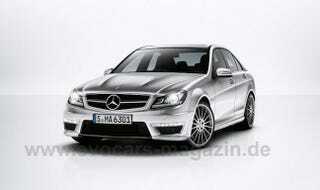 2012 Mercedes-Benz C63 AMG First Photos Leak? With the new Mercedes-Benz C-Class en route, the C63 AMG version can't be far behind. Sure enough these purported first pics show typical Teutontic tautening of the vanilla version. Motivation come from the still-ill-named 6.2-liter V8. One interior shot below.